I finished my fifty third lap around the sun a couple of days ago. It's a race I've been in since birth and while I hope I'm around for many more laps, I feel I'm probably closer to the finish line than the start. Maybe not. There's some people out there who are 108, right? In order to keep in "running shape" for this race, it takes a little more effort each year. While there's not too much I can do about my mug and hairline - which is more a rumor than an actual line - there are certain things I do to keep it all together on the inside. My weekday 20 minute yoga routine keeps the muscles from drying out like leather and snapping when I least expect it. I also now take three different pills every day. Twice a day fish oil pills which cure everything from heart disease to hardening of the arteries, or so I'm told. Also twice a day Glucosamine which is supposed to help sore joints. This is my latest snake oil treatment, as most days, either a knee or a hip, or a shoulder hurts. Those playing days on the 8th grade football team are taking their toll. LOL. Then, once a day during the winter months I take a Vitamin D pill, or my "happy pill" as I call it. Winter's hard enough without taking my sun away. This one keeps me from going all Jack Nicholson in The Shining. I got a couple of really cool gifts to help me through my fifty fourth lap around the sun and beyond. The first was a Smith Corona Sterling typewriter from my wife. I'd been wanting one for a while and her friend Barb found it at a thrift store and managed to get it for $6.50. Six fifty!!! It is in amazingly good condition. My intent is to use it mainly for poetry during those moments of writer's block or when I just need an inspirational change. Typewriters always bring back bittersweet memories for me. There's something about the noise, clatter and dinging that is endearing. The sounds of writing progress. At the same time, I remember that misspelled word during that 11th hour typing of a term paper caused some colorful language and required backspacing and then using correction paper or white out. Things got better with an electric, but sometimes it only meant you could misspell words with greater speed. 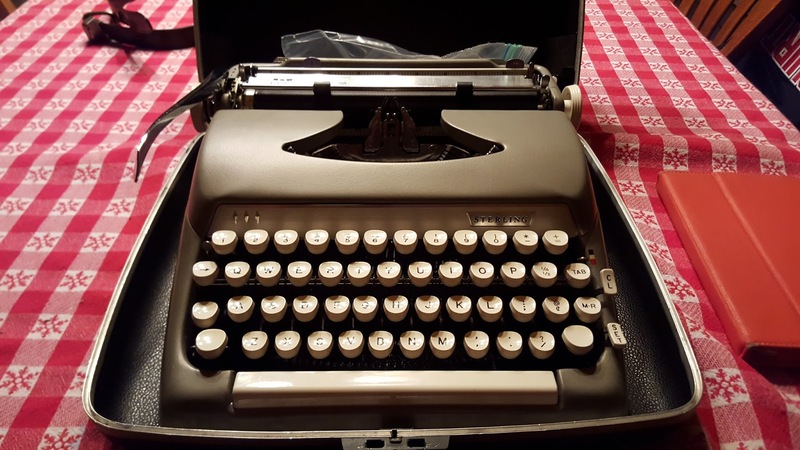 I remember a time when I had to use a coin-operated typewriter by the hour for a paper as a student at the University of Minnesota. The bugaboo about this particular machine was the letter 'S' didn't work, so I had to write them in. (All the other machines were in use by other frantic students and I HAD to get this done.) I would have hated to have to read that paper. It's a wonder I ever graduated. Even a greater wonder that I chose to be a writer after such traumatic experiences with typewriters. Anyhow, I can't wait to start using it. The other gift I got was a Cobra Golf Driver from my friend, Steve. I've been thinking about getting a new driver for a long time, but because I don't golf much, I could never really justify a big outlay to get a better driver. The one that came with my custom clubs is nice, but the head is small and unforgiving. After golfing with Steve last fall, he remembered I'd said that I was looking at getting a better driver at some point. 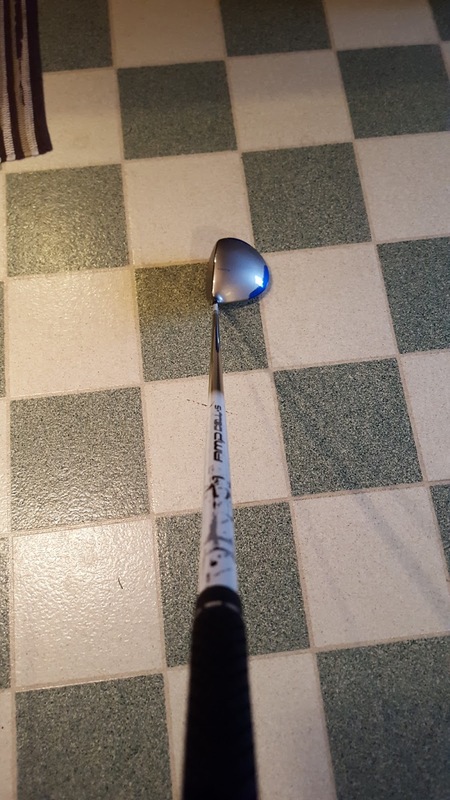 Because he'd gotten a new driver, he gave me this one. I can already tell it is going to help my game immensely. (And my game NEEDS help.) Furthermore, it may come in handy for my son, Ben, as he joins the Waukesha South High School golf team this spring. As I look toward my fifty fourth lap, it is my hope is that it is even half as good as my fifty third. I am so incredibly fortunate to have great family, friends, neighbors and church folks as part of my solar relay team. Pass me the baton, because I'm hitting my stride and feeling good.